The Livestock Area is Educational, Interactive & Amazing! 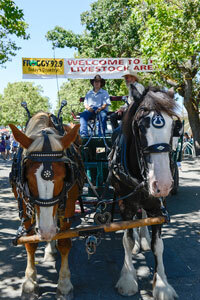 FFA and 4-H youth are at the heart of the Sonoma County Fair and the Jr. Livestock Auction. Witness the culmination of a year’s work for young aspiring ranchers and farmers who select, purchase, feed, and groom livestock to be judged, graded and sold at the Fair. Their projects include steers, lambs, hogs, rabbits and poultry. We are very proud of our young farmers and invite you to meet them at this year’s Fair. Why Support the Jr. Livestock Auction? It was another record-breaking year for the 2017 Sonoma County Fair Junior Livestock Auctions. The combined total for all auctions was an impressive $1,583,789. The auction totals across categories have far out-paced last year’s numbers, further emphasizing the community’s strong support of youth agriculture programs. All prospective buyers or authorized solicitors/bidders must register prior to auction day. Please email the Entry Office for more details. Free Rides Daily this is the way to see the Fair’s famed Livestock Area—from a wagon pulled by draft horses. You’ll roll along past the sheep barns, the cattle barns and the livestock area. Catch a ride at the "Welcome to the Livestock Area" sign. Check your daily schedule for times.